The eye is often compared to a camera. The front of the eye contains a lens that focuses images on the inside of the back of the eye. This area, called the retina, is covered with special nerve cells that react to light. These nerve cells are very close together in the middle of the retina where the eye focuses the images that we see. This small part of the retina is called the macula. Sometimes the nerve cells of the macula become separated from each other and pull away from the back surface of the eye. This is called a macular hole. Why do people get macular holes? Sometimes macular holes are the result of an injury or a medical condition that affects the eye. In some people, it seems to be a side effect of the changes that normally occur in the eye as we age. The cause of most macular holes, however, is not known. Macular holes are associated with aging and usually occur in people over the age of 60. Less common causes of macular holes include injury to the eye and long-term swelling of the macula. The symptoms of a macular hole are quite similar to those of macular degeneration. Like macular degeneration, it is also most common in people aged 60 and over. However, the conditions are quite different, and you should see an eye specialist if you suspect either. A macular hole generally only affects your central vision, so your peripheral or ‘side’ vision will remain unaffected. You may have difficulty with reading and close work, and you may notice grey or black spots, or blank areas, in your vision. Macular holes usually affect one eye, rather than both, although it is possible for both eyes to be affected by macular holes. Macular holes usually develop over time, so you may not notice any symptoms until your vision is affected. Early signs include blurring and distortion of your vision, and you may notice straight lines (such as window frames, telegraph poles or lines of text) appearing bent or wavy. The Amsler Grid is a simple test that will help you determine if your vision is distorted in this way. 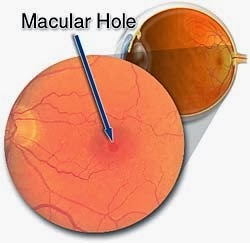 he size and location of the macular hole will determine how much it affects your vision. There are also three stages of macular hole, and vision will generally deteriorate as the condition worsens. Another test called optical coherence tomography (OCT) is most helpful in making an accurate macular hole diagnosis. With OCT, a special diagnostic laser camera is used to photograph your retina. It measures the thickness of the retina and is also very sensitive at detecting swelling and fluid. OCT can also diagnose small macular holes that are too small to be seen in an examination or with angiography. Is a macular hole the same as macular degeneration? No, they are two different diseases even though they have similar symptoms. An eye care professional will know the difference. Macular hole surgery involves using tiny instruments to remove the vitreous gel that is pulling on the macula. 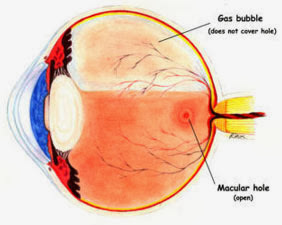 The eye is then filled with a special gas or oil bubble to help flatten the macular hole and hold the retinal tissue in place while it heals. If you have vitrectomy surgery, you must maintain a constant face-down position after surgery to keep the bubble in contact with the macula to allow effective healing. This can range from a few days to a few weeks, depending on your surgeon’s recommendation and the size of your hole. A successful result often depends on how well this position is maintained. The bubble will then slowly dissolve on its own, or, in some cases, be removed by your Eye M.D. If you have a gas bubble, you cannot fly in an airplane until the gas bubble has dissolved, as a rapid increase in altitude can cause a dangerous rise in eye pressure. You must also not undergo general anesthesia using nitrous gas, though it is generally safe to have general anesthesia without using nitrous gas. As the macular hole closes, the eye usually regains some of the lost sight. How much vision is restored generally depends on the size of the hole and how long it was present before surgery. How does a doctor know whether someone has a macular hole? A decrease in the ability to see fine details when a person is looking directly at an object, no matter how close or far away it is. A change in vision that makes a person feel like he or she is looking through a dense fog or thick, wavy glass. The appearance of a dark spot across the middle of the field of view. When these symptoms are caused by a macular hole, they will usually occur in one eye only. It is very rare for someone to have macular holes in both eyes. If any of these symptoms occur, it is important to schedule an appointment with your doctor as soon as possible. The doctor will use a special instrument to look inside the eye and see whether the macula has a hole in it. What happens in the operation to treat a macular hole? The surgical procedure for macular holes is performed under local anesthetic so the patient is awake but does not feel the procedure. One theory about the cause of macular holes is that the gel-like fluid that fills most of the inside of the eye is pulling on the macula. Thus, the first part of the operation for macular hole treatment is to remove this gel-like material, which is called the vitreous fluid. The procedure to remove it is called a vitrectomy. The surgeon will make small openings in the eye to insert special instruments that are used to remove the vitreous fluid. The surgeon will remove the fluid and any small pieces of tissue ("membranes") near the macula. This is done to prevent anything from pulling on the macula preventing the hole from closing. The fluid in the eye is exchanged with a sterile gas, which keeps pressure on the macular hole until it heals. Patients will need to maintain a face-down position for 1 to 2 weeks to keep the gas bubble in place and help close the hole. How successful is surgery to repair macular holes? Surgery is successful in closing the hole in more than 90 percent of patients. However, the success rate is closer to 60 percent if face-down position is not maintained. The amount of vision that typically is regained is variable. Ask your doctor to estimate the chance and amount of visual improvement you might expect. Keeping in tune with your disease or condition not only makes treatment less intimidating but also increases its chance of success, and has been shown to lower a patients risk of complications. As well, as an informed patient, you are better able to discuss your condition and treatment options with your physician.